In December 2018, Affordable Housing Advocates (AHA) and the Greater Cincinnati Homeless Coalition won important first steps in their campaign by establishing an Affordable Housing Trust Fund. Working with housing champion Councilmember David Mann, advocates were able to convince city council and the Mayor that establishing the Affordable Housing Trust Fund (AHTF) was an important step that would make it easier to secure both one-time funding as well as a dedicated source. The AHTF passed with eight yes votes and one abstention. This strategy has proven true in that by early February 2019, Councilmember Mann and Mayor John Cranley proposed a $700,000 capitalization of the new AHTF coming from the city-owned Norfolk Southern Railroad. City Council voted to approve the funding in early March. 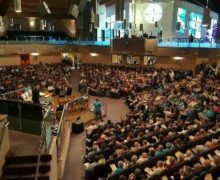 AHA and the Homeless Coalition started their campaign in earnest in 2017. 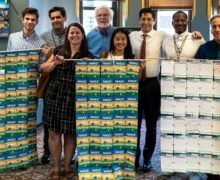 They built support for the Fund by educating people in the affordable housing and community development field about housing trust funds as a tool to develop and preserve affordable housing. They then educated council members on what affordable housing trust fund have done in other cities and the impact it could have in Cincinnati. The campaign hit a hiccup at the end of 2017 because of the election outcomes and changing members of council. Having to start again with a new council, advocates doubled down on their efforts to convince council that the time is now to deal with the housing crisis in Cincinnati. An important tool that helped advance advocates’ efforts was a study on the affordable housing shortage by Community Building Institute and LISC in February 2017. 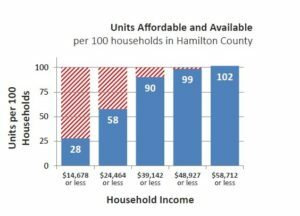 The report showed that Hamilton County is needs 40,000 affordable homes, 28,000 of which are needed in the City of Cincinnati. The report gave strong data to back up the urgency that many Cincinnatian were facing on a daily basis. Cincinnati advocates realize that while this victory is an important first step, they are continuing to work for a dedicated source for the AHTF. They are doing their due diligence by researching revenue sources that they will to present to city council later this year. Not stopping there, they also plan to engage the broader community in the campaign to make sure that all Cincinnatians have a safe, affordable place to call home. Affordable Housing Advocates is a group of housing providers, advocates and consumers dedicated to the goal of ensuring good, safe, accessible, affordable housing for all people in Southwest Ohio. Their focus is on meeting the housing needs of very low, low, and moderate-income individuals and families. 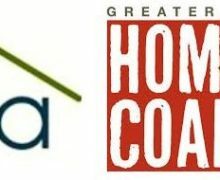 The group formed to share the expertise and information gathered by its members over decades of service to the Greater Cincinnati community in the area of affordable housing and to initiate and support plans of action that will further the creation, retention and accessibility of affordable housing in our community. The Greater Cincinnati Coalition for the Homeless (GCCH) was formed in May of 1984 for one purpose: the eradication of homelessness in Cincinnati. We are a unified social action agency, fully committed to its ultimate goal: the eradication of homelessness with respect for the dignity and diversity of its membership, people experiencing homelessness and the community. The Coalition works towards this goal by coordinating services, educating the public, and engaging in grassroots organizing and advocacy. The Coalition has a membership of over 60 agencies, and hundreds of individual members and supporters.